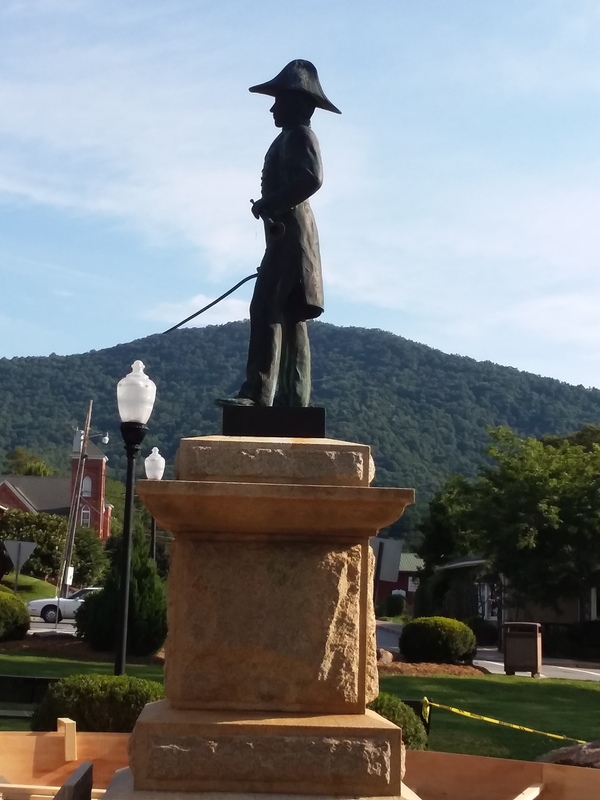 Otway Burns, Revolutionary War hero, still stands guard on the village square of the town named for him. Other than preparing for a new walkway – Old Otway is exactly the same after 20 years. 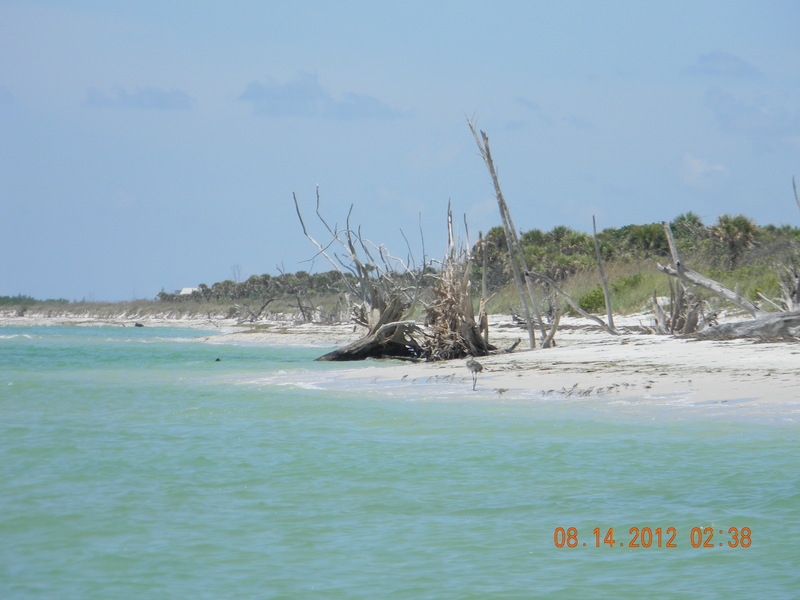 Want to be revitalized? This is not an ad for Centrum Silver, Geritol, Alive!, or Nugenix. It’s a suggestion: If you want to refresh your attitude and want your faith restored in America, visit a small town in “fly over” country. I recently had the opportunity to do this. What a tonic and antidote for the toxic times we live in. 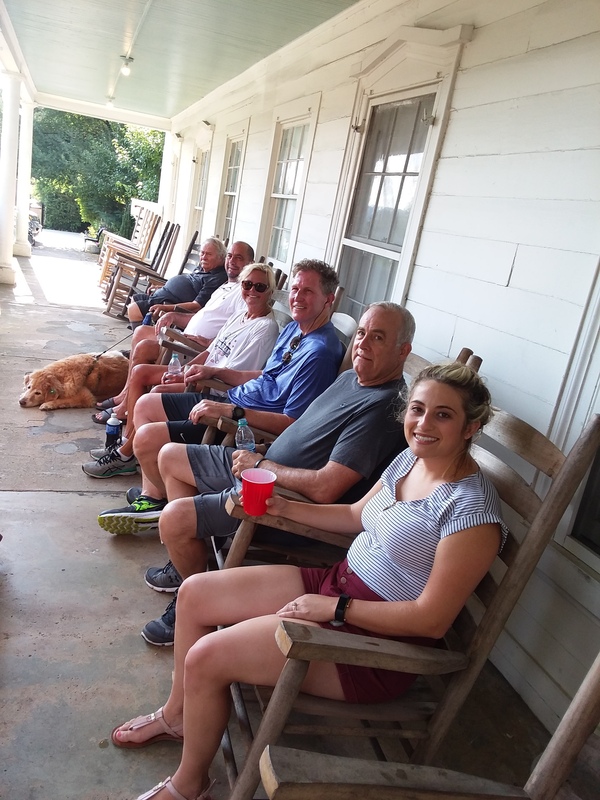 The occasion for my visit to the wonderful North Carolina town of Burnsville was my dear and best friends eightieth birthday. It’s a relationship that I’ve treasured for 50 years. His birthday celebration and the wonderful people who made it successful is an inspirational story and I’ll save that for a future post. It is my relationship with CTC that exposed me to Burnsville and the North Carolina mountain country. Only 35 miles from Asheville, the town is the Yancey County seat. 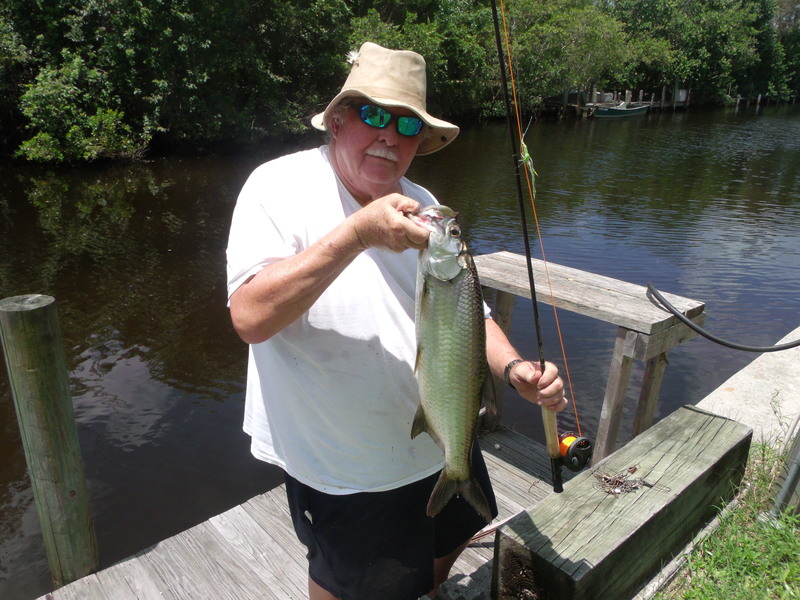 Its cool air and crystal waters are a summer oasis for flat-landers like myself and that’s what attracted my Floridian friend to its environs. Burnsville was/is the setting for one of my novels, September on Echo Creek. 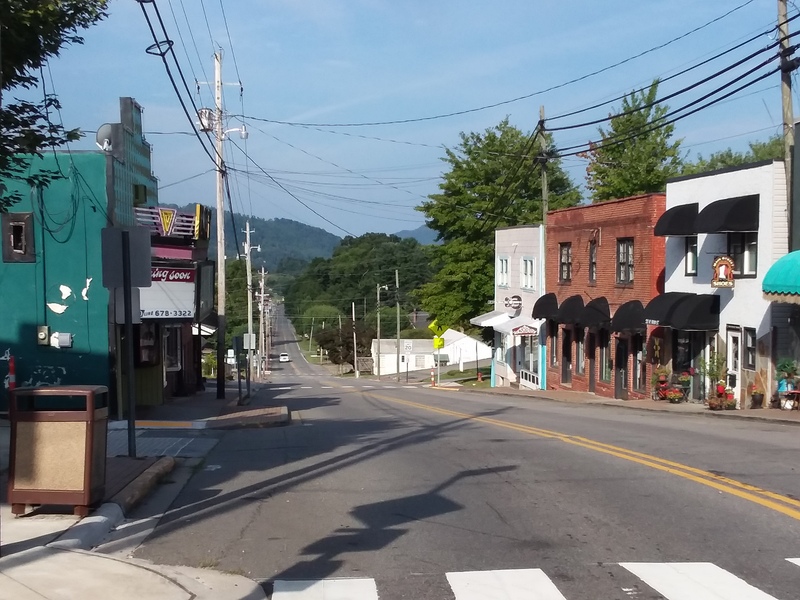 Main Street in the mountains – Sunday morning & peace are still one. Some of Burnsville’s stores have changed since I wrote September on Echo Creek. New businesses have replaced old ones in some cases. I miss the general store that was an institution for years. The library has moved a few hundred yards to new digs. But, the town’s flavor and charm haven’t changed. I recognized many of the business names that were around when my novel was published. Most importantly, the friendly nature of the establishments is a reassuring constant. A great example of this is the inn where we stayed. The Nuwray is living history. 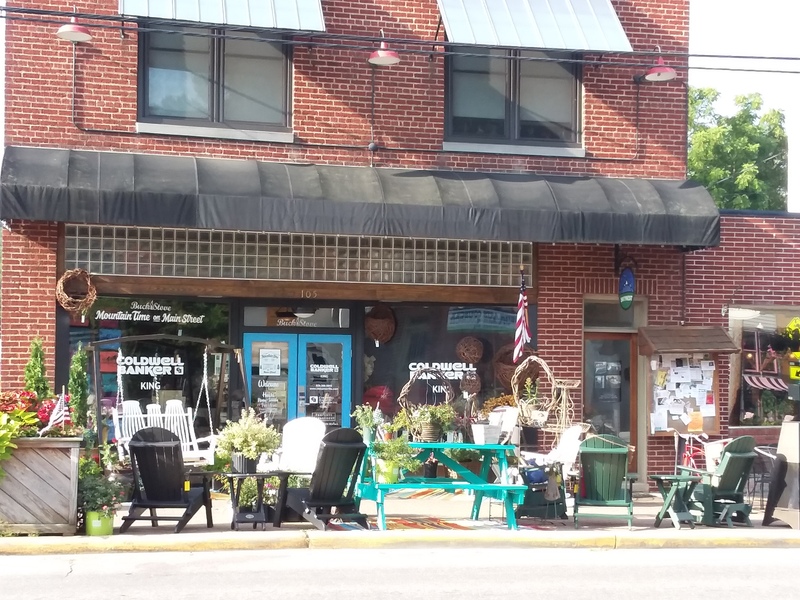 Built in the 1830’s, it is a can’t miss stop for people who are antique lovers, history buffs, and observers of Americana … a place so warm and wonderful its effect is far more invigorating than a shot of B-12. Great small town restaurants surround the Nuwray. Find a place to park your car and forget it. 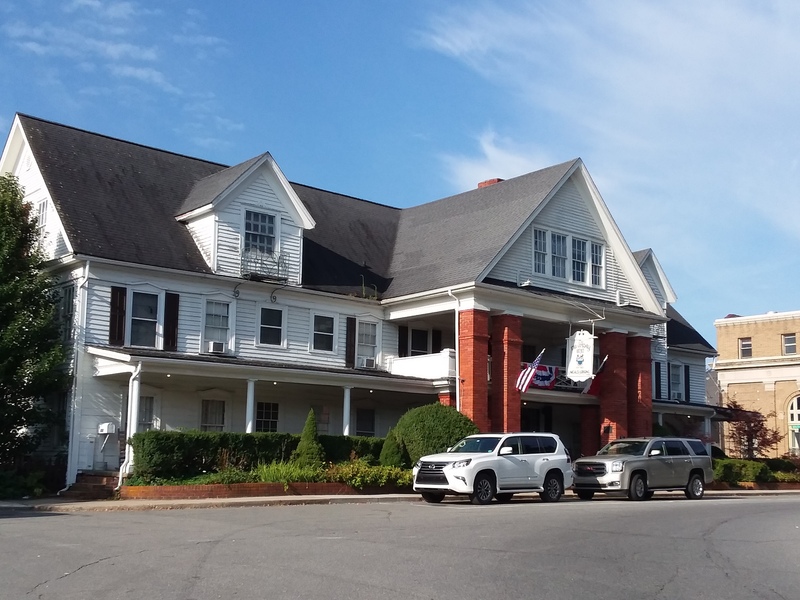 The Nuwray Inn – America at its best, yesterday and today. However, the most encouraging and soothing thing I discovered was that the Burnsville people were as I remembered. Stable, friendly, and helpful, they remain the same as when I wrote about them in my novel September on Echo Creek … published 20 years ago. The heroine, Gaylynn, escaped poisonous relationships by fleeing an environment that threatened to destroy her. Her life was controlled by guilt strings. The Burnsville people rescue her and help her cut her bonds. The fabric of these wonderful people hasn’t changed. The Brendas, Ferrells, Bos, Annettes, Kens, Micheals, Micheles, Randys and Christinas are the same as the ever-lasting earth. The earth grows the bread to nurture our bodies. These small town people grow relationships that satisfy our souls. People still rock and talk in small town USA. Shouting is reserved for mountain to mountain communication. Try this if you want some solace for your psyche. Find a map of a rural location 100 miles from a big city. It can be in your area … or not. Extend your index finger and point to a small town. Look for a spot with a past like the Nuwray. Visit and stay there. Don’t try to rush around and see the sights. Toss your car keys on the dresser and forget them. Believe me, if you’re not certain about a place, the Nuwray and Burnsville are a marvelous choice. Go. Then just enjoy breathing. Enjoy people. Life in America is still great if we’ll take the time to live it. Special meanings are sometimes received in unusual gifts. 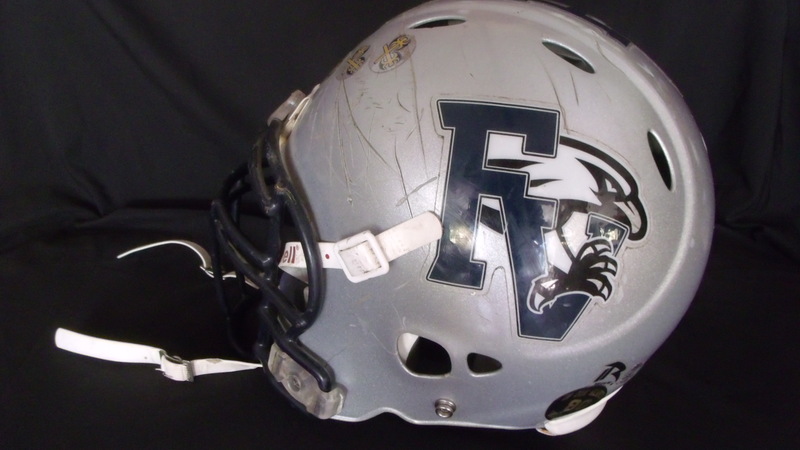 One football helmet. Used. Scared. Priceless! Yesterday, my wife found a package that had been delivered by UPS. We evidently weren’t home when it was delivered for the delivery man placed it in a place where it would be safe from the weather. It was in plain sight, nestled in a group of boxes of similar size and shape. Obviously, it went undetected for a few days. In the box were Christmas presents sent from my daughter and her family. My daughter is a busy sales executive (V.P. ), but she manages to take the time each Christmas to find a gift that transcends the obligatory … her gifts are personal. I’ve come to expect and look forward to their arrival. But this year … this year, I received a priceless gift in that plain brown corrugated box. However, it was not from her. You see it pictured above. It is a football helmet, one worn by my Grandson Brad. With it was a note, a note I choose to selfishly keep as one of those objects that is of the “heart,” private. It is for me to savor and for me alone. That’s one of the things that makes it so special. As we age we appreciate life landmarks more; we know life’s important issues because we have lived it. As a grandparent of four marvelous young adults, I have been blessed. Like all grandparents, I want to do what I can to make each one successful and, most importantly, happy. When I looked at my inventory of items I might share with Brad, my experience coaching football was something I believed would help him. He was an eager learner. He never lost the flex in his knees, kept his toes in so he could start quickly in any direction, kept his power line low, and never let a blocker get to his outside leg when he played outside linebacker. He was a very good player. As satisfying as seeing him play successfully was, receiving the helmet is an indication that he learned things that transcend the physical skills he was taught. The greater values a sport teaches us are values that are retained and used as we go through our lives. Brad values our relationship on a deep level; it is one of those lessons. The value of team work, personal sacrifices required to attain a goal, embracing hard work, learning that we are a victim if we choose to remain one, and the concept of loyalty to ideas, to organizations, and to people are notches on a person’s character belt. Thanks for a priceless gift, Brad. I’ll sleep well tonight. 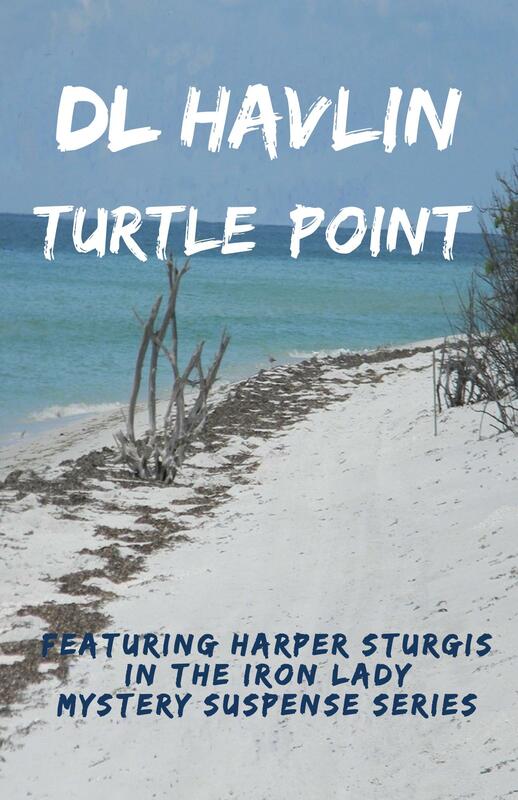 The location used as the model for “Turtle Point” from my upcoming novel of the same name. Caesar said, “I came, I saw, I conquered.” I’ll adjust, “I went, I learned, I enjoyed.” That sums up my experience attending the Unicorn Writers Conference. It was as advertised, and one of the better conferences I’ve attended. Importantly, it delivered the most critical elements needed to be valuable to authors at all levels of proficiency … a superb faculty, a high quality selection of top-flite agents, and editors from some of the largest publishers in the business. The classes did what they should do: after the writer participated in the session they left with another bit of knowledge for their authoring tool box. The facility was impressive, had a literary feel, and was spacious enough to avoid the hint of crowding. Stephanie Evanovich did a fine job presenting the keynoter, in an auditorium whose AC had a nervous break-down. One problem for me was a result of the spaciousness; it seemed the distance to the nearest restroom was considerable no matter where you were. Problem – I’m awaiting hip replacement. There were a few “clerical issues” that caused some problems that aggravated, but were overcome. That said, I’d highly recommend attending the Unicorn Writers Conference. I’ll return. At the risk of redundancy, the collection of agents, editors, and faculty was one of the best assembled at a conference I’ve attend in twenty plus years of going to these events. The review sessions were long enough to be of value, not a ten minute quickie that allows for no depth of analysis. Go. As I mentioned in a previous post, the interchange with fellow authors allows you to learn and to educate. I picked up some great research sources, names of some important publishing contacts, etc. My gray hair and my list of traditionally published novels generated one repeated question from those starting on the “trail of tears.” The question was “What is the one most critical piece of advice you have for aspiring writers?” My answer – Don’t rush the process! First, don’t just sit down and hope something will happen magically at the keyboard. Find a topic, idea, or cause that you wish to champion … one you can address with passion … then WRITE! Remember the authoring process has just begun when you finish your first draft. Wash, polish, wax then strip and begin again. When you think it’s perfect, repeat the process. The reason there is more manure in the literary pipeline than a Washington DC sewer is the failure to strive for supreme quality. My book, Bully Route Home, is released. It might take your favorite bookstore or online source a little time to get it to you. My publisher is in the process of changing distributors and, well, #@%!$&*#@ !!!! Be patient. If you want it quickly, I have a limited number. You can go to my web site and order from me. Use the link in the right hand column. I met some wonderful new folks like Bob Zaslow, Stephanie Evanovich, Chuck Miceli, and Gail Cleare … and renewed some old relationships with super people like Kathy Sands. (I’m her Gator Man.) I’ll talk about these in future posts. Definition of frustration: Having a nine state, thirty-one book store tour set to introduce your new book, bbbbuuuutttt having to go to the first three-quarters sans books. Sigh. A flyer for a substitute is like hunting lions with a sling-shot. Till next time … and soon. Thanks to ALL who served … Your sacrifices allow us to enjoy freedom today. A large portion of our nation’s people weren’t born when the world fought two wars that created unimaginable suffering and loss. Time has obscured the fact that the world was given the choice of becoming a monolith where nothing but one set of thoughts and values would be tolerated. Conform or die. The brave veterans chose to risk death to oppose one system, one man rule. Their triumph was costly. Reading history is different than living it. It’s a fact that a large ideological force would prefer that we forget the evils that thrust those wars on our country. It simply doesn’t fit their agenda. They’d prefer to rewrite history than learn from it. The eighty million plus human’s who died becomes a lesson unlearned. Today’s world is so close to the world in 1939 it is frightening to those who think. Does is mean that every war we’ve fought was a “good one?” No. Regrettably there have been times we’ve miss used our military power. But the military people who fought, did their best to honor their duty. They did as commanded. One can find no fault in that. They deserve our respect-it is right that we honor them. I have traveled to close to 100 countries. Some like the USSR no longer exist. We are not perfect, but by the sociological balance test, this is the best place I’ve seen to live. The great part of living here is if you don’t like what you see you’re free to try find enough others that agree with you and change it … or you are free to leave. Thank you US soldiers, sailors, Marines, air force, and coast guard veterans. This day is for you. In reality, every day this country survives, should be. Once in a very great while, two arts combine to create one of those monuments that help describe mankind. We lost one half of such a combination when Leonard Nimoy left us yesterday. Nimoy was Spock. Spock is logic; Spock is science. Gene Roddenberry’s brilliance and Leonard Nimoy’s acting genius gave us one of those mileposts we measure mankind against. As human’s, we are prone to be governed by what we want to see or what we wish things were like. We act as if those wishes and wants were all within our grasp. 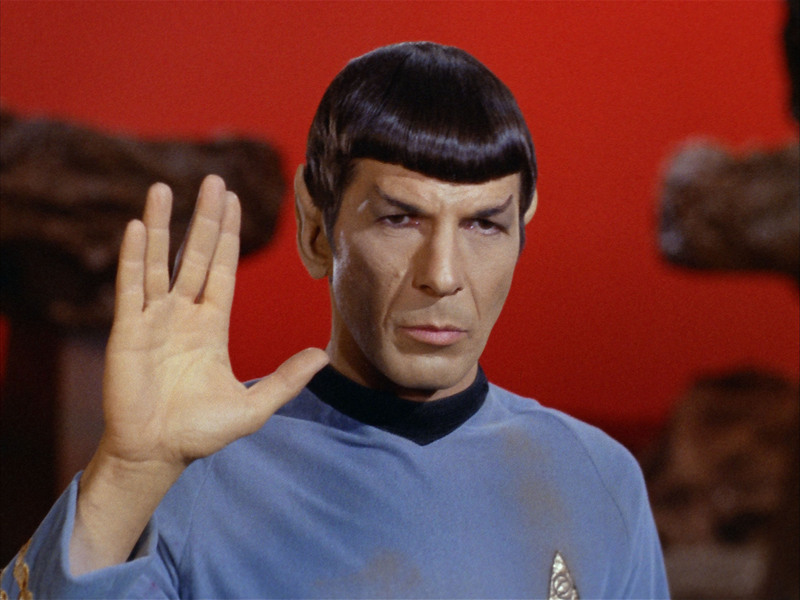 Spock is the embodiment of reality … that truth and fact are things that demand consideration in human reckoning. These two men remind us, that as humans, we must dream to improve and, as humans, must not ignore reality if we are to achieve. Thank you Margret and Vivian for giving us Scarlet O’Hara, thank you Harper and Gregory for Atticus Finch … and thank you Gene and thank you Leonard for Spock. Most of us have the same complaint– we don’t have time to do the things we want. Ever wonder how much time that would take? If you had time to do those things, do you wonder how long would it be before the attraction was gone? Ask someone who has the luxury of time, someone retired or wealthy without need to work. Consider this … Is it the activity we desire what makes it special … or is it the special effort we have to make to get the time to enjoy it … that makes it so? Happy Birthday you grand and glorious country. Sorry I’m a few weeks late, but I wanted to make a birthday wish that would help you past your current problems. Really help. A lot of panaceas came to mind. It was tempting to pick one, toss coins in a wishing well, and mumble an incantation. The more I thought about a silver bullet answer to save you … the one idea, the one person, the one of anything, the more apprehensive I became. What made this country great, and it has been the greatest nation of all time, has been the sum, not the one. That was true in 1776, and if we are to survive and prosper … to continue to be a great nation … it must be true today. The sum adds all the “D” words that forged this nation: Dissent, Disagreement, Differences, Diversity……. The amalgam of those “D” words spawned ideas that built the colossus that is the United States. One “D” word is notably absent from the list. It’s Division. Unfortunately, right now we’re closer to being the Divided States of America. We’re certainly not the United ones. Logic whispered in my ear, “What we need for your friend (that’s you my country) is the reincarnation of those founding fathers. We need their ability and willingness to disagree, at times so vehemently that some refused to speak to each other and communicated through the written word only. But, when decision time came, decisions that impacted the nation’s welfare, personalities, ideologies, and lust to retain control were sacrificed. It was their wisdom that prevailed.” Made sense to me… at first. Reality smacked me in the face like a three day dead mackerel, wielded by a NFL tackle. Even our revered forefathers would find tough sledding with today’s media twisting their words to favor whatever ideological side for which they propagandize. They’d have to be willing to batter their skulls against a brick wall. That would require stubborn … Ah! I had my wish for you. Here it is. United States of America, I wish for you … a bunch of stubborn people like Don Roebling, the grandson of the Brooklyn Bridge’s builder, and Marine General Holland Smith. It was their stubbornness and their dedication to you that helped you win World War II. Remember them? I learned a lot about Smith and Roebling when I was doing research for one of my books. There couldn’t be two more different people, yet their determination was a common bond. Smith fought the Navy Brass to get the Higgins Boat and Roebling’s LVT adopted as landing craft. He was willing to sacrifice his career to do what was right for his men and his country. But, he did it in the confines of the rules. When Roebling learned of the Marine Corps interest in his tracked craft, invented as a hurricane rescue vehicle, he gave them prototypes at a token price. When Congress maneuvered obstacles to try to “disqualify” his invention to favor their cronies, he signed over all his patents for one dollar, provided all the engineering changes the Marines wanted, built them, even provided spare parts … for nothing. He was incensed when the same congressmen and politicos that tried to torpedo his vehicle’s approval turned coat and tried to court his favor by sending “appropriations.” Roebling returned all the funds to the government accompanied by some choice words. He stayed within the rules, unlike is enemies. Without Roebling and Smith there would have been no D-day or Pacific island campaign as we know them. Where could we find the forefathers’ wisdom, for my “Stubborn Brigade?” They’d need that. BAM! It occurred to me that all that wisdom was in a package. That package is called the Constitution. It’s infinitely flexible, if all provisions are honored, so all our people have their say. The one thing that it doesn’t include is being ignored or interpreted to suit ones personal views. So … Happy Birthday America! I’m sure those stubborn men and women are on the way!